Nicole's Needlework: Geranium House Finished! I got it finished up last night - Finally! At the rate I was going I didn't think I'd ever get it done! 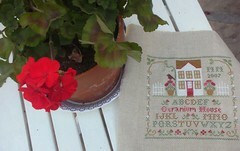 Country Cottage Needleworks "Geranium House"
I'm now working on getting "A bit of February" by Lizzie Kate finished up. It should go pretty fast! :) Write later! Beautiful finish, Nicole. I really need to buy this chart - geraniums remind me of Australia - they grow wild there, and they are huge bushes - I love the smell! Thanks for visiting my blog! Your Geranium House is very pretty. I had a good start on this one, and then I put it aside. Yours is so pretty I may just start on it again soon. Fantastic finish! It is a lovely piece. It looks great Nicole. TFS. Congratulations, Nicole! GH looks lovely!